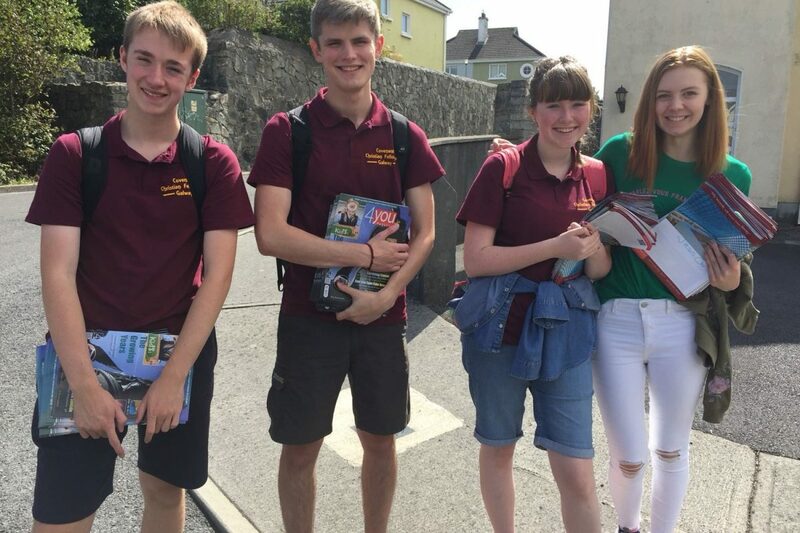 Last month, Elisabeth Moore, James Heggarty, Bethany Smyth, Daniel McCollum, Matthew Magee and myself took the bus down to Galway for Covenant Christian Fellowship’s annual GO Team. During the five days we had the opportunity to proclaim our saviour to people of many different backgrounds and nationalities in that vibrant city. Each day we would start with a time of bible study led by the team leader Patrick Hamilton where we looked at the Lord’s Prayer. The most challenging of the studies for me was on the petition “Your kingdom come”. This is both a prayer for the success of the gospel in the lives of nonbelievers and a personal commitment of our whole lives to the Lordship of Jesus. Bible Study was followed by prayer thanking God by his goodness to us and committed to him the work we planned for that day. During the afternoons the team distributed booklets telling the story of Mez McConnell as well as invitations to a public meeting on Monday evening where the Rev. Matthew Brennan gave his testimony. Matthew Brennan story was amazing, from suffering abuse in an orphanage in Silgo, Matthew spoke of how God provided for him and gave him hope. In the evenings we did street preaching on Shop Street in Galway city centre and many people briefly stopped and listened. Pray that the Spirit would work even through something small that they heard. During the afternoons two team members would man the bookshop and on Monday afternoon a book stall was set up on Shop Street giving out free Christian literature. Some of the team also did door-to-door work using a questionnaire about important beliefs. Through these questionnaires we were able to have several encouraging conversions with people about what they believed and present the gospel to them. Please pray that God would change people’s hearts through what they have heard and read during this week.